The following was written by Dr. Jennifer Lee. Dr. Jennifer Lee is a graduate of Harvard Medical School and a Board-certified Dermatologist. She is the Medical Director of REN Dermatology, a comprehensive medical and cosmetic skin care center in Franklin, Tennessee. She has been on clinical faculty at Harvard Medical School and Vanderbilt University Medical Center. Dr. Lee has been named “Top Doctors” of Nashville, “Teacher of the Year” at Vanderbilt, and “40 under 40” by the Nashville Business Journal. I’m a big fan of humidifiers in the bedroom during the winter. This simple solution keeps me from waking up with a scratchy throat from dry air or my face feeling dehydrated and tight. A humidifier helps to combat the dryness from indoor heat and the overall lower humidity levels in the air. Harsh weather calls for soothing skincare. Switch to a more gentle cleanser or creamier version like Celavive® Gentle Milk Cleanser. If you have particularly sensitive skin, you may want to skip any exfoliating treatments containing alpha-hydroxy acids altogether during the colder months. Moisturizing is essential to maintain healthy skin during the winter. The recommendation has always been to moisturize immediately after the shower to best lock in moisture. Some recent studies suggest it may not be as important whether you moisturize damp or dry skin. The bottom line is your skin simply needs added moisture. Dry skin can lead to irritation, breakouts, and itchy, red, flaking rashes called Asteatotic dermatitis—which unfortunately, we see quite often in the winter, especially on the lower legs. This condition will usually clear up with a prescription ointment from the dermatologist. Don’t forget to take care of your hands during cold, dry winter months. I often see patients who develop dermatitis of the hands and fingers. Due to extreme dryness and irritation small fissures occur, which are painful! Use moisturizers liberally on your hands, especially at night. Even during the winter months it’s important to protect your skin from the sun. I like Celavive Protective Day Lotion SPF 30 under my foundation, or I use a tinted moisturizer that has SPF 30 or higher and skip the makeup. This way I’m still protected from sun damage if I’m running errands during the day or driving with bright sun shining through my car windows. Like Celavive Hydrating + Lifting Sheet Mask help boost your skin’s moisture. Serums can be applied under your moisturizer, 1–2 times a week. When masking, remember to apply moisturizer immediately after the mask is removed and the serum is absorbed. Don’t forget your omega-3 and vitamin D supplements during the winter months. Omega-3 fatty acids have been shown to improve skin barrier function and help maintain skin balance. Vitamin D is most effectively synthesized by sun exposure on the skin, but if you live in a part of the world with short days and decreased sunlight during winter, it’s beneficial to supplement your vitamin D intake. Winter is a magical time of year. And with a few simple steps, it’s easy to keep your skin dewy and dazzling through this chilliest of seasons. Who do people follow? The stern? The judgemental? The egotistical? The pessimist? The rich? The bullies? Or: The optimist! The Cheerful! The Encourager! Those who motivate, inspire, educate! The ones who make you laugh and enjoy your journey in life! I work with these serious light hearted leaders, shown here, who give others hope and a positive direction for their lives. 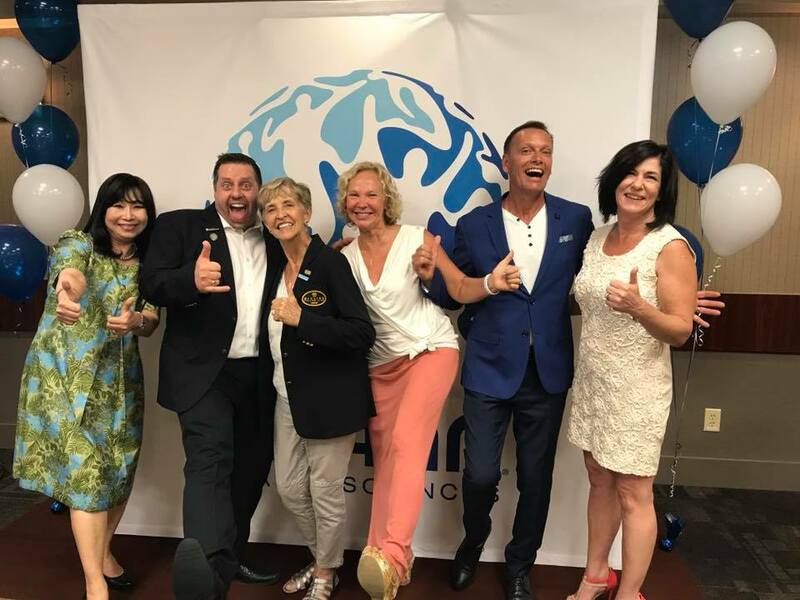 Carolyn Lee, GM, Usana Canada, Paul David Dueck, me, Susanne Cunningham, John Cunningham, Alison Savard, Usana Canada Field Director. 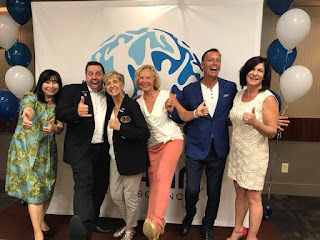 You can see that they can laugh and have fun, at the same time that they are serious about making a difference in people's lives through Usana Health Sciences. I am presently going through a difficult change in my life, where I am finding that it is often family, friends and business associates who give me the strength and belief in myself to go forward with a measure of confidence. They are leaders in empathy and outreach. What other traits make for good leadership? Oprah Winfrey: "Don't underestimate your power. Hate is potent, but so is kindness. And goodness, and grace. Use yours generously,"
As I watch the drama of leadership in U.S. politics, I see the ugliness of nepotism, lies, bullying, coverups and greed. When this happens, it affects the mood of the country in so many ways. The same goes with negative leadership in business, education, charities and community organizations. My university advisor: Always encouraging others, wise, kind, knowledgeable, humble. A Business President: Flexible, Striving for Excellence, Open to New Ideas, Team Involvement for Greater Success, a Quiet Sense of Humor that Lightened Discussions and Difficult Choices. My Father: Interested in my activities and personal growth, determined to give me a wide variety of fun and educational activities, kind, caring, a role model as a leader in business. My Husband and Life Mate: Patient. Supportive. Loving. Respected in his career. A Family Man. Balanced. Fun with Children. Talented. Community Involvement. A Man of Deep Faith. What is my personal goal as a leader in business? To embody as many of those above traits as possible! I care about whatever people are going through and to build them up to push through challenges and disappointments. Help people believe in themselves and to celebrate each step forward, each success large or small. Encourage team effort. Be open to change and new ideas. And back to laughter in leadership.....to break down barriers and to help others relax and receive your message. What would you add? BEEP! BEEP! BEEP! BEEP! An entire night has passed in the blink of an eye. The last thing you remember is your head hitting the pillow in the dark. Now, seemingly seconds later, the incessant, blaring of the alarm clock wakes you. But it does no help in reminding you what day it is, where you are, or perhaps even who you are. Surely, you’ve experienced a morning like this: groggy, confused, and sleep-deprived. The effort to keep your eyes open feels exhausting. Standing up and leaving your warm bed behind is torturous. The day’s long to-do list awaits you and seems daunting. 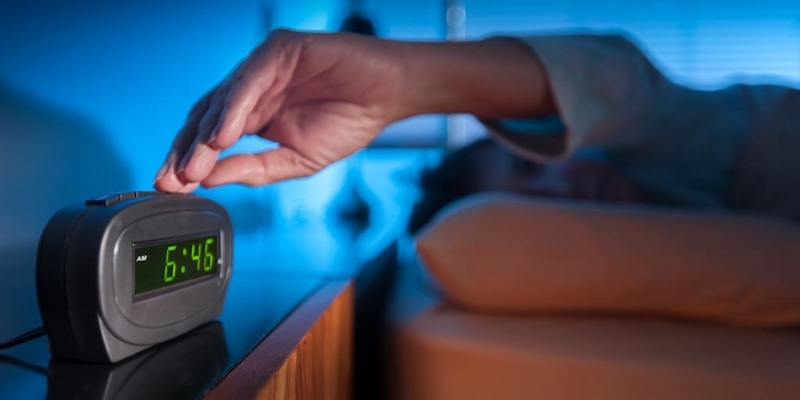 Foregoing solid, quality sleep can affect your day in a big way. It’s important to remember that the effects of sleep deprivation are not just physical, like the physical feeling of exhaustion. Just like the scenario above, low-quality or insufficient sleep can manifest itself mentally and emotionally. That can include a loss of concentration, short attention span, and even anger. Lack of sleep can also mean a lack of motivation and sharp decision-making skills, forgetfulness, and anxiety. Sleep is important for feeling rested, but it’s more than physical downtime. Sleep is also your brain’s chance to recharge and regroup. Let’s look more in-depth at the physical and mental benefits of regular, quality sleep. Sleep gives your body and mind an opportunity to power down and recharge. It might seem like this period is simply an absence of consciousness, where the body goes into a sort of idling mode. However, during sleep, your body and brain are actually working hard. Sleep activates a process that helps you rest, repair, and recharge. Take a closer look at the processes during the four different stages of sleep. Stage 1 is the period between wakefulness and sleep. In this stage, everything starts to slow down. Muscles soften, heart and breathing rates decrease, and brain-wave patterns begin to change. Stage 2 is light sleep. Your muscles loosen even more, heart and breathing rates continue to slow, and your body temperature drops. Stage 3 is the deepest sleep stage. Here, your heart and breathing rates come to the lowest point of the entire sleep cycle. Your muscles are extremely relaxed and rousing you would prove difficult. It’s this stage that is integral to quality sleep. Without enough time spent in this sleep state, you will not awaken feeling well-rested. Stage 4 (the final stage of the sleep cycle) is known as REM sleep, or rapid eye movement sleep. The first three stages involve non-rapid eye movement sleep or non-REM (NREM). In many other ways, REM is also quite the opposite of the preceding three stages. Heart rate increases and breathing rate can quicken and become irregular. Eyes move rapidly behind the eyelids and brain activity livens. 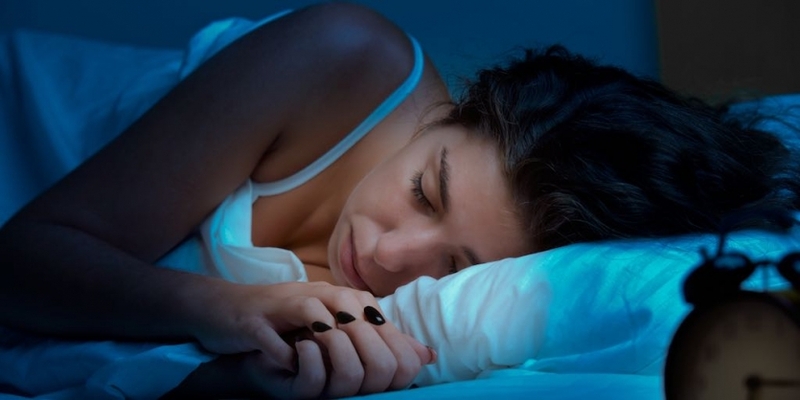 Dreaming is commonly experienced during the REM sleep stage. Your body might actually experience temporary paralysis of the limbs, a protective measure to keep the body from acting out movements about which you dream. These four stages are cycled through in succession until you wake up. It’s necessary for you to experience both NREM and REM sleep to remain sharp through the day. 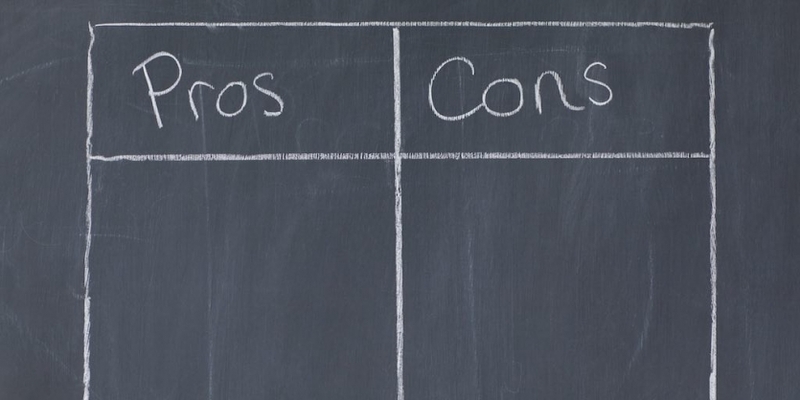 Without both, memory consolidation is harmed. As you’ve surely experienced, after a night of little-to-no sleep, it can be very difficult to recall even simple information quickly. Caffeine: This stimulant usually wakes up the body and can keep you from feeling tired. In fact, caffeine actually blocks the substance adenosine, a chemical that your body secretes to make you sleepy. While this can be a benefit in the morning or during a long day, ingesting too much caffeine in the late afternoon or early evening can affect your sleep. Alcohol: Drinking too much alcohol too late in the evening can disrupt your sleep patterns. More specifically, it can disrupt your REM sleep, leaving your cycles incomplete. On a simpler level, alcohol is a diuretic, meaning it increases the urge to urinate more frequently. So, having too much alcohol can also disrupt your rest because you might have to make more frequent trips to the bathroom. Diet: The timing and content of your last meal can affect your readiness for bed. Think of the blood sugar surge that comes from a meal or snack. The boost in energy late in the day can keep you from winding down easily. Physical activity: Regular exercise can help you maintain a regular sleep schedule. Just don’t exercise too late in the evening before bed, or your body won’t have time to settle back down before turning in. 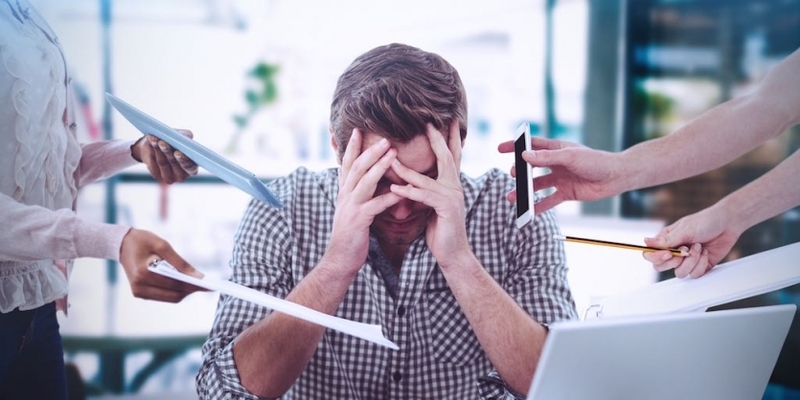 Stress level and emotional state: Consider how stressful your day was or your emotional state throughout the day. If you’re feeling especially worn down, worried, or otherwise stressed, it can be very difficult to quiet your mind for bed. Bright lights: You’re constantly being bombarded by light, with can impact production of your sleep hormone. Make sure your room is dark, and take a break from bright screens (TV, phones, and tablets) before you tuck in. Consider cutting back on how much caffeine you drink, or impose a “caffeine deadline”—a point at which you won’t ingest any more for the day. Drink alcohol in moderation or impose an “alcohol deadline” so that your body has time to readjust before bed. Avoid eating a meal or post-meal snack too late in the evening. Exercise regularly, preferably early in the day. A good starting point is 20 minutes per day—and work up from there. Plan for at least seven hours of sleep. You may need more than seven. But this is a good target to work up to if you’re currently and routinely getting less than this benchmark. While you may not be able to reach seven hours immediately, start incrementally heading for bed sooner so the change is gradual and more doable. Set a regular bedtime and waking time—and stick to it, even on weekends. This kind of routine is helpful for keeping your body’s internal clock in rhythm. Incorporate relaxation or meditation into your wind-down routine. Turn off screens, dim your bedroom lights, play light instrumental music. Light stretching can help your body release tension before laying down. © 2018 Ask The Scientists. All rights reserved. Your immune system is in a battle every day. That’s its job. You’re protected by a coordinated defense. Cells, proteins, and chemical signals join forces against bacteria, viruses, parasites, and other pathogens. And your immune system also helps in wound healing, cellular and tissue turnover, and repair. A healthy, functional immune system is a complex machine. It contains many layers, subsystems, tissues, organs, and processes. But a basic understanding can help you see what you need to maintain healthy immunity. Imagine your body as a castle to be defended. The first layer of defense are your physical and chemical barriers. They’re the high, thick walls that turn away many intruders. Your skin is the most obvious physical barrier. And it’s a good one. Your largest organ is a waterproof covering that protects you against pathogens. Skin’s construction, substances on the surface, and other compounds in deeper layers help it provide protection. Skin does a good job, but there are other paths into the body. That’s why other physical barriers exist. Your upper respiratory tract has tiny hairs called cilia. They move potentially harmful material away from your lungs. Your gut barrier blocks absorption of possibly harmful substances. And your excretory (bathroom) functions physically expel pathogens. Mucus blurs the line between the physical and chemical. Whatever category you put it in, mucus is an effective trap for invaders. It’s produced by membranes throughout your body. This thick, gluey substance is your body’s sticky trap, grabbing microbes and not letting go. Other chemical barriers include: tears, saliva, stomach acid, and protective chemicals produced inside of cells and in your blood. The innate immune system is sometimes called the non-specific immune system. This subsystem of your larger immune defense is loaded into your genetic code. That’s the innate, or inherent, part. And it provides more general protection, destroying any microbes that enter your body. That’s the non-specific part. Your cellular defenses kick in if a pathogen survives your physical and chemical barriers—which could also be considered part of the innate subsystem. That’s where phagocytes (a specific type of immune cell) come in. These white blood cells act like guards patrolling your body and destroying invaders. These cells are found throughout the tissues of your body. They kill pathogens through a process called phagocytosis. It’s complicated, but there’s a simple way to understand it. Phagocytes eat the invading microbes. They were named phagocytes for a reason—phago comes from the Greek for “to eat.” Phagocytes ingest or engulf the invaders. While trapped, several killing mechanisms are deployed to destroy the pathogen. Some phagocytes have receptors that distinguish between healthy cells and potentially harmful substances. (They also deal with turnover of dead and dying cells.) Other pathogen eaters are chemically signaled to sites where they can be most useful. Phagocytes even help with the cleanup and repair after the invaders are destroyed. Your adaptive immune system is like an immunity database. After encountering a specific pathogen, you have immune cells that can recall the best way to destroy it. That’s why it’s also referred to as specific or acquired immunity. The original pathogen exposure can be intentional or accidental. That doesn’t matter. A normal, healthy response starts with an antigen. Think of an antigen as the bar code of each cell. Just like every item in the grocery store has a unique bar code, each cell type has a unique antigen code to identify it. These antigens—mostly proteins—can also identify pathogens. Our immune system has learned to read these antigen codes. When they recognize something as being foreign, they initiate an immune response. Each unique antigen triggers the creation of a unique antibody. The y-shaped antibody binds back to the corresponding antigen and marks the invader for attack by other immune cells. Some antibodies can even take care of business for themselves. Lymphocytes (another specific type of immune cell) are the main cells involved in your adaptive immune system. Two types of white blood cells—T and B cells—are produced in your bone marrow. They can attack and kill pathogens on their own, or assist other white blood cells in the responses. T and B cells form the basis for your body’s immunity memory bank. B cells present antigens and create and release antibodies. Memory T cells—those that survive previous attacks—quickly and effectively respond to known pathogens. Together, they help your immune system efficiently and effectively destroy known bacteria, viruses, or other pathogens. Above, you’ve read about the way a normal, healthy immune system functions. But your defenses can be impacted by your environment, diet, stress, sleep, travel, and other lifestyle factors. Get at least seven hours of sleep a night—and avoid pulling any all-nighters. Exercise regularly to promote memory cells, enhance skin immunity, and mobilize immune cells. Minimize stress as much as possible or practice healthy coping strategies, like exercise. Practice good hygiene, including frequent handwashing, so your body doesn’t have to deal with as many pathogens in the first place. Team USANA (athletes who use the USANA products) captured 34 pieces of transition metal—13 Gold, 14 Silver and 7 Bronze. That’s four more than what was collected in 2014. If you’re wondering how that stacks up against the overall official standings, it stacks up nicely. If Team USANA were a country, USANA athletes would’ve had the second highest tally, right behind Norway. USANA was founded on science by a microbiologist who loves the periodic table. Which has provided hundreds of thousands of people with top-rated supplements for more than 25 years. But what does the chart of elements, a diagram that most of us haven’t seen since high school, have anything to do with USANA’s sponsored-athletes? Well, depending on how you look at it, that question could truly be answered in several ways with nutrition being the base of them all. We by no means are indicating or suggesting that the periodic table brought on any of the below accomplishments. But if we narrow it down to three transition metals that sit in column 11—Au, Ag and Cu—and add in the global sporting extravaganza that took place last month in East Asia, you should hopefully get what we’re trying to do here. For 18-days, nearly 3,000 athletes glided, jumped, flipped and twirled for a chance at top honors. Tears of joy and disappointment were shed, historic moments were captured and for some, retirement from the sports they’d dedicated their entire lives too were celebrated. And in the process, Team USANA captured 34 pieces of transition metal—13 Au, 14 Ag and 7 Cu. That’s four more than what was collected in 2014. Now the big question. Who made history, who double-dipped and who celebrated their final run on the world’s biggest stage? USA Luge’s Chris Mazdzer captured silver and the first medal in US history in the men’s singles event. U.S. Freeskier Alex Ferreira took home silver in his debut in freestyle halfpipe. US Speedskating’s Brittany Bowe secured bronze in the team pursuit, while John-Henry Krueger took silver in the men’s 1,000m. Teammates Meaghan Mikkelson, Natalie Spooner and Rebecca Johnston earned silver in women’s hockey. Canadian bobsledder Alex Kopacz went gold in the two-man event. US Ski and Snowboard brought home an additional 14 hunks of metal—7 gold, 4 silver, 3 bronze. Speed Skating Canada collected seven—2 gold, 2 silver, 3 bronze—three of which were captured by short tracker Kim Boutin. USANA’s Korean speedskaters walked away with seven honors—3 gold, 4 bronze. U.S. freeskier Devin Logan became the first female to qualify for two disciplines—slopestyle and halfpipe—finishing 10th and 15th. USA Nordic’s Bryan Fletcher completed his second and final Olympic appearance with a top 10 finish in the team event and top 20 finishes in two individual competitions. Taylor Fletcher made his third appearance and finished 10th in the team event alongside his brother Bryan, and 35th in the normal hill event. Two-time Olympian Matt Antoine finished 14th in the men’s skeleton event. Canadian speed skater Ivanie Blondin took to the ice in four events, finishing in the top six in three of them. Ski jumper Sarah Hendrickson celebrated her second Olympics with a 19th place finish. Elise Christie of Great Britain Short Track was just shy of a podium with a 4th place finish in the 500m event. Korean ice dancers Yura Min and Alex Gamelin helped added to a 9th place finish in the team event.